I would like to thank those that attended my session at TechDays 2010 and I hope that I was able to pass the message of what’s new on C#. Thsi book, with several practical examples, presents how to build web applications using ASP.NET 4.0. Dynamic resolution as well as named and optional arguments greatly improve the experience of interoperating with COM APIs such as Office Automation Primary Interop Assemblies (PIAs). But, in order to alleviate even more COM Interop development, a few COM-specific features were also added to C# 4.0. 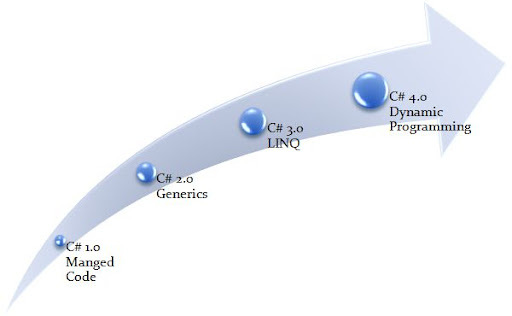 The major feature of C# 4.0 is dynamic programming. Not just dynamic typing, but dynamic in broader sense, which means talking to anything that is not statically typed to be a .NET object. Like I mentioned in my last post, exposing publicly methods with optional arguments is a bad practice (that’s why C# has resisted to having it, until now). As part of the co-evolution effort of C# and Visual Basic, C# 4.0 introduces Named and Optional Arguments. In my last post, I went through what is variance in .NET 4.0 and C# 4.0 in a rather theoretical way. C# 4.0 (and .NET 4.0) introduced covariance and contravariance to generic interfaces and delegates. But what is this variance thing? The first release of C# (C# 1.0) was all about building a new language for managed code that appealed, mostly, to C++ and Java programmers. On my last post, I introduced the PredicateEqualityComparer and a Distinct extension method that receives a predicate to internally create a PredicateEqualityComparer to filter elements. Today I was writing a LINQ query and I needed to select distinct values based on a comparison criteria. I like to use both StyleCop and CodeIt.Right to validate my code – StyleCop because it’s free and CodeIt.Right because it’s really good. The procedures to define document compatibility in Internet Explorer 8 are well documented here, but I’ve seem many developers and system administrators that are not aware of this. This week I had to restore my son’s PC due to a game he had installed that rendered Windows 7 in a state it was unable to reboot or recover from.